Horton has been selected to receive a Bronze INTERMAT Innovation Award in the components, equipment and tooling category. Horton will be honored for its WindMaster Revolution high-efficiency, hybrid-flow fan. Horton has been selected to receive a Bronze INTERMAT Innovation Award for its WindMaster Revolution high-efficiency, hybrid-flow fan. Horton Europe GmbH & Co. KG was honored in the components, equipment and tooling category. 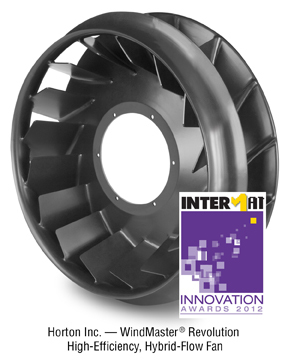 The award will be presented at the INTERMAT show on April 16, 2012 in Paris. “We’re very pleased to receive this recognition of our continuous efforts to innovate and develop products that help our customers meet the highest worldwide standards for efficient performance and environmental sustainability,” says Franz Frieling, Horton’s director of sales and distribution Europe. Horton’s WindMaster Revolution is optimized to move air more efficiently around the engine and through the under-hood compartment. It combines the optimal features of axial-, mixed- and radial-flow technologies. Engineered for compact engine compartments, WindMaster Revolution fans offer fuel-saving performance and significantly lower operating noise. WindMaster Revolution meets the requirements of EPA10, Euro VI and Tier 4 engines. WindMaster Revolution is available in two sizes. The 550-millimeter fans are engineered for off-highway equipment and vehicles and medium-duty trucks. The 750-millimeter fans are engineered for heavy-duty trucks and some off-highway equipment and vehicles. INTERMAT is an international exhibition of equipment, machinery and techniques for the construction and materials industries. The exhibit is held every three years and attracts more than 1,400 exhibitors and 200,000 international visitors. The INTERMAT Innovation Awards competition celebrates international innovation and is open exclusively to INTERMAT exhibitors. The awards recognize outstanding developments in equipment, techniques, services and products. Winning innovations must demonstrate an outstanding advance in technical design and technology or in cost savings, operation, usage or environmental sustainability. They also must comply with European regulations and standards. Entries are judged by a panel of European specialists from research and industry. To learn more about Horton WindMaster Revolution, visit our booth number 5b M 011 at INTERMAT or visit our website http://www.hortonww.com/intermat. With 60 years of industry experience, commitment to service, reliability and innovation, Horton is a premium worldwide provider of fan drives, fans and suspension products. Horton’s comprehensive research and development processes are driven by a dedication to exceed industry requirements today and in the future. The company has manufacturing plants in the United States and Germany, with licensed manufacturing facilities in Australia and the United Kingdom; offices in the United States, Canada, Mexico and Germany; and representatives in Brazil, Russia, South Korea, China, India and Australia. Horton products include VMaster® and Stratis® Viscous Fan Drives, VMaster Di and Stratis Di Viscous Fan Drives and Controllers, DM Advantage® On/Off and Two-Speed Fan Drives, Arctis® Two-Speed Fan Drives, WindMaster® Revolution High-Efficiency/Hybrid-Flow Fans, WindMaster Fans, WindShift™ Modular Fans, Shogun™ Modular Fans, Electromagnetic On/Off Fan Drives, Klondike Series® Replacement Fan Clutches for the Kysor® K26RA as well as repair kits for Kysor’s K26RA, K22RA and K22FA, PolarForce® Two-Speed Conversion Kits, DM Advantage® Conversion Super Kits, Genuine Horton repair kits, remanufactured fan drives and Roller Bushing Suspension Products. Kysor is a registered trademark of BorgWarner.